Each place in Spain has its own way of celebrating Carnival, with distinctive elements that give it special cultural interest. 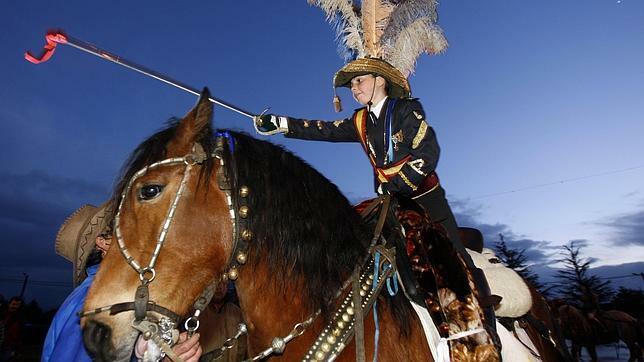 The chirigotas of Cadiz or the impressive parades that turn the Canary Islands into Rio de Janeiro are among the best known examples, but Galicia hides in its typical Entroidos a symbolism and tradition which gives the holidays an almost religious meaning to its citizens and attract an increasing number of visitors every year. 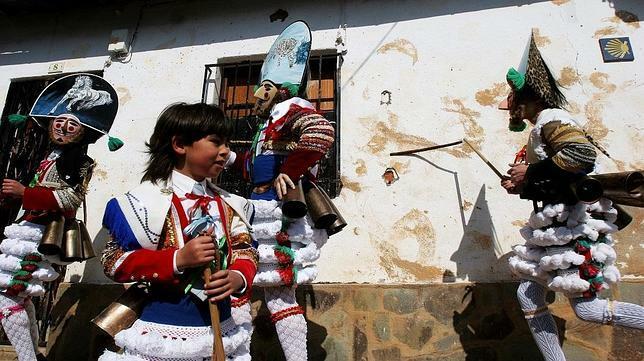 One of the most famous images is the cigarrón of Verín, the most famous mask in the region of Monterrei, characterized by jumping and pounding their zamarra and anyone who crosses his path is not allowed to retaliate. Although the origin is not absolutely certain, in the past the cigarrón is believed to have been either a person that asked for money from passers-by, a tax collector, or a hunting guide for the regional nobility. In Laza, the central figures of the festivities are the peliqueiros, very similar to their counterparts from Verín, whose name is taken from the fur worn on the back of their masks as a ponytail. Their attire consists of an unique jacket, white shirt, tie, bows, tassels and a whip. The best time to see them is the Sunday of Carnival as they leave the religious service. 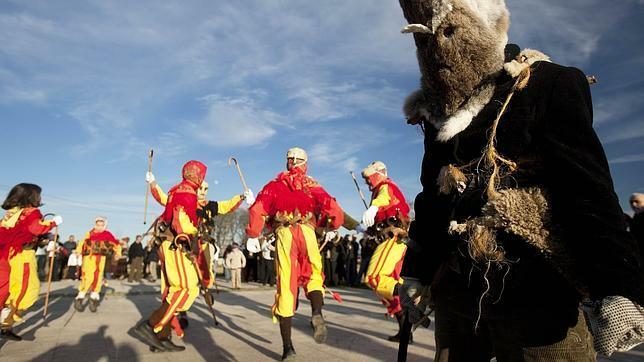 The pantallas are the center of the festivities in Xinzo. 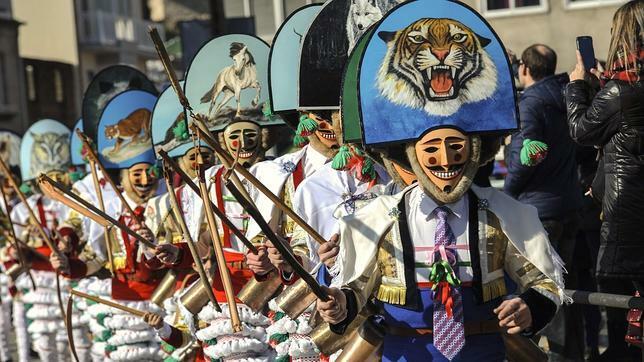 To complete the famous triangle of Ourense Carnival celebrations, the authentic mecca of Galician tradition, you can not miss the pantallas of Xinzo de Limia. Dressed in long white pants and colorful ornaments, their task is to ensure that everyone wears a costume and annoy those who do not by jumping around them and making noises. Unlike the previous two, the pantallas are not “armed” nor do they touch their victims. 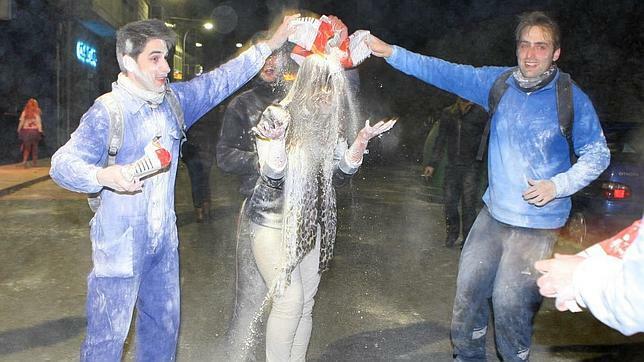 The fariñada is a traditional flour fight. 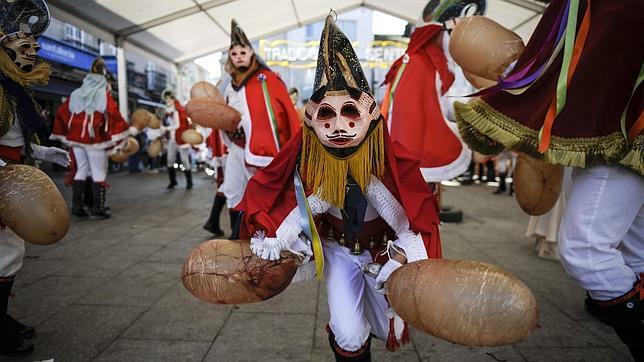 Carnival is not only days of revelry, but in Galicia it is also used to cultivate traditional cuisine. The filloas (similar to crepes or pancakes), orejas (a fried doughy dessert resembling a pig´s ear and sprinkled with sugar), and cocido (a traditional stew of chickpeas, sausage, turnip tops, and all bits of pork) fill every home. Another of the protagonists of Entroido in the town of Viana do Bolo is androlla, a sausage made from fat gut stuffed with marinated pork ribs, salt, paprika, and garlic. Also, in Viana do Bolo you can find the popular fariñada in which participants throw flour like at the famous Tomatina festival in Buñol or water party in Vilagarcía. In the region there are “generals” of all ages. In the region of Ulla another notable event is held each year, the Entroido do Xenerais, documented since the 1870s, in which various scenes are represented and marked by social satire. It is a spectacular event for the garments and ornaments, as well as the horse riding. Participants are differentiated depending on the parish from which they come. 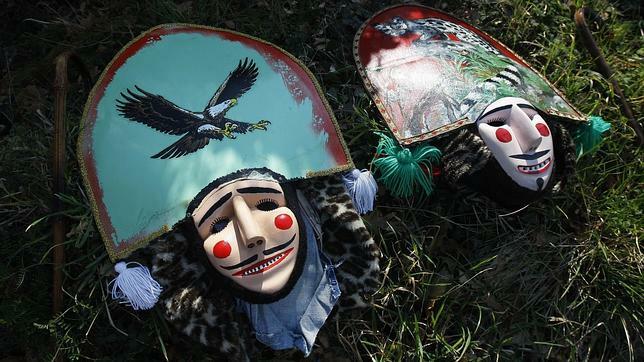 The masks of the “felos”. The felos of Maceda are cousins of the peliqueiros and cigarróns. The origin of its name is uncertain and the theories considered range from the Germanic fillon, in reference to its authority to hit others, or to a variant of the word felón. In the past, they were in charge of the people during the Carnival celebrations, and its initial anarchic character has now changed to groups organized by masks. The “peliqueiros” and “volantes” take over the town. The Ribeira Sacra, in addition to being a good wine area, is where one of the most characteristic Entroidos of Galicia is held. The ribeirao of the Lugo town of Chantada is a tradition recovered during the mid-1990s after a few years absent from the agenda of its inhabitants. The big day is Tuesday, when the burial of Santo Entroido occurs, who is put into a coffin, covered with leaves, to symbolize the end of Entroido. Then, the volantes dance around the burial box while the priest and the sacristan attempt to resurrect the corpse.